V3 was preceded by John Adam’s pivotal decision on 17th March, 2013 (shortly after the release of V2) to publicly hand over stewardship of the Delving Deeper name and game to myself. V3 would therefore be Immersive Ink’s first solo endeavor–although in actuality any project of this scope naturally involves numerous people. 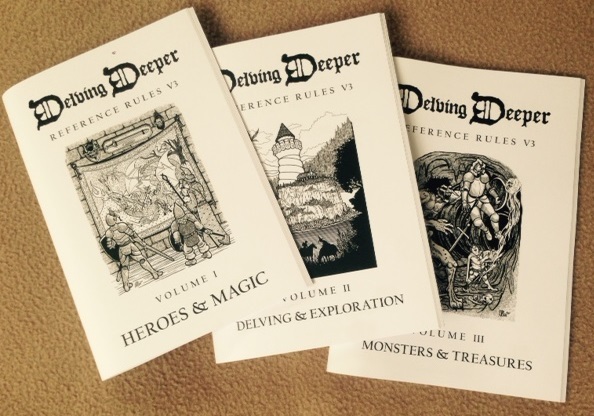 #DelvingDeeper V3 was eventually issued in May 2014 after about ten months in the works (see below for a little more insight into this). As V2 was really an errata release (V1 plus integrated errata = V2), V3 was in fact #DelvingDeeper’s first significant revision in its then two year (post-relase) history. V3 retained the classic three digest-sized booklet format, albeit renaming the individual booklets. The so-called #DelvingDeeperReferenceRules were re-issued as three PDFs at no cost, which are still available today. 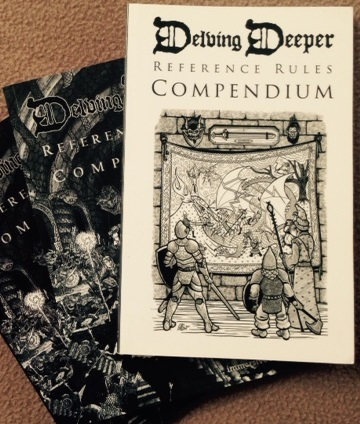 The cover art on the booklets (by Mark Allen) remained unchanged since V1+V2, and were now the only illustrations in the set; interior maps associated with the sample dungeon had been excluded. The title page of each booklet identifies it as “Version 3 May 2014” and bears the publishing mark of Immersive Ink only (that’s me). The interior typeface is changed to 9.5pt CalifornianFB; a more spacious, Goudy-based type. The interior tables were now numbered, and now had lighter weight borders and shading. The overall effect was (in this reader’s opinion) an improved reading experience. Another significant addition was a formal definition of normal, heroic, and superheroic in terms of numbers of Hit Dice. 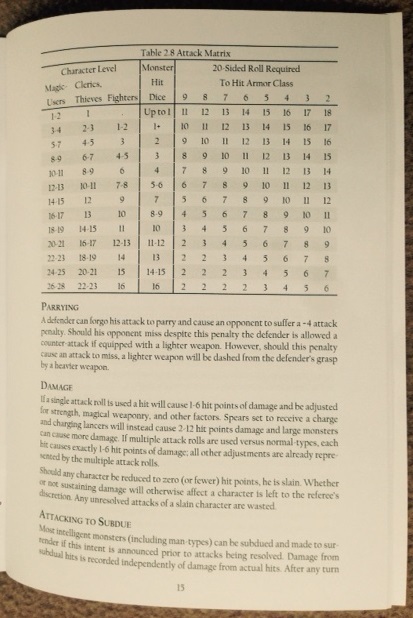 Although not stated in the original game, it was hoped this would enable some players to override normal by replacing exactly one definition, rather than having to search for dozens of instances of “X many HD” throughout the text. (DD allows for a broad definition of normal–fewer than 3 HD–but many folks still prefer EGG’s stricter definition circa 1975–up to 1+1 HD). 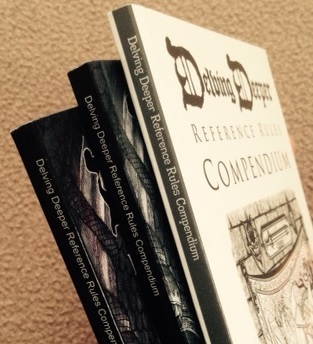 What few people know is that during the ten months leading to DD V3’s release as three booklets, it was also prepared for release as a single volume Compendium via Lulu’s print on demand platform. I have the single extant copy of the never published V3 Compendium (note the Mark Allen cover art directly from Vol 1). V3 never went public for two reasons: Partly because licensing the cover art was proving to be difficult, and–in the main part–because I’d botched the credits! 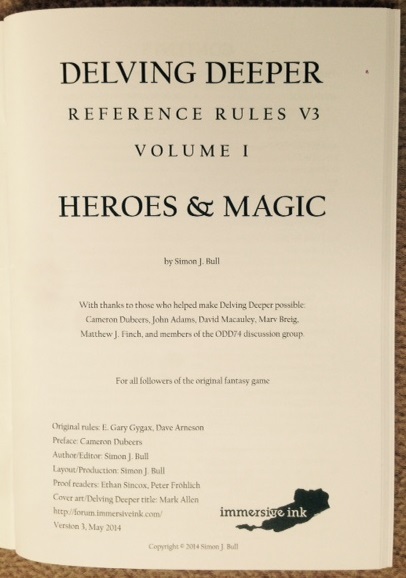 V3’s title page was in fact a working draft rather than a finished product, which ultimately meant the V3 Compendium had to be superseded before the POD version could be released. All this meant V3 itself would be short-lived, soon to make way for the now popular V4.